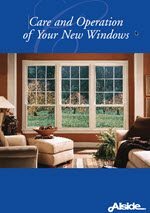 Alside Windows & Doors has provided exceptional building products for homes and businesses for more than 65 years. They have a commitment to innovative design, advanced technology, superior craftsmanship and outstanding customer service that has defined them as a true industry leader. For a variety of looks from traditional to contemporary, no matter what the application is, Alside has you covered. 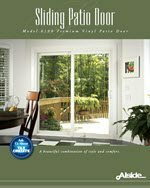 Choose from a complete product line that offers Single-Hung, Double-Hung, Sliding, Casement, Awning, Swing & Clean, Bay, Bow, Garden, Picture and Specialty Shape Windows as well as Sliding Patio Doors. 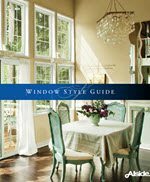 This guide is designed to help you understand the various window styles available – from a traditional double-hung model to sleek casements and room-expanding bay and bow windows. 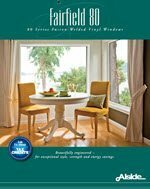 Performance-engineered windows protect us from intense heat,frigid cold and a wide range of challenging weather elements, yet allow us to enjoy the warmth and beauty of natural light from the comfort of our home. 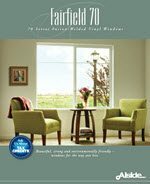 Fairfield 70 Series Windows deliver all of this and more, including year-round energy savings and classic beauty that’s virtually maintenance-free. your home, inside and out. 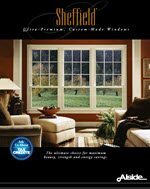 Masterfully crafted with a premium vinyl construction, fusion-welded technology and highperformance glass, Fairfield 80 Series will exceed your every expectation for quality and value. 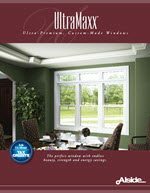 Ultra - Premium , Custom - Made Windows. The heart of the Sheffield platform is Definity vinyl. This advanced vinyl compound is rugged, durable and virtually maintenance-free. The material’s low thermal conductivity makes it the perfect choice for window manufacturing. Ultra - Premium , Custom - Made Windows. The heart of the UltraMaxx platform is Definity vinyl. This advanced vinyl compound is rugged, durable and virtually maintenance-free. The material’s low thermal conductivity makes it the perfect choice for window manufacturing. Mezzo Windows are the ultimate collaboration. Elegant, sleek style mixed with take-charge strength and energy efficiency. The aesthetics are everything you want in a window and the performance power is cutting-edge. Strong, durable and weathertight, with custom beauty, easy upkeep and excellent value. 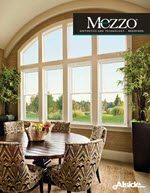 Mezzo Windows are made for you. One simple way to add drama to any room is by bringing in more natural light and a larger, more open view of the outdoors. That's exactly what Alside Casement Windows deliver. The slimline-designed frame is among the narrowest in the industry – maximizing the glass area for a generous infusion of beautiful daylight. 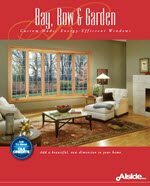 Alside Bay and Bow Windows are the perfect addition to any home. They create an instant feeling of added spaciousness and light while providing a beautiful focal point. Alside Patio Doors extend your home’s ambience to the great outdoors, visually expanding and brightening any room. And the expanded glass area means added light – so every season is even more enjoyable. 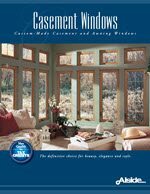 This guide is designed to answer some of the most frequently asked questions about the care and operation of your new windows. We are confident that your new windows will prove a perfect fit for your home and your lifestyle.